Category Archives for "Accounting and Auditing"
Want to know how to audit investments? You're in the right place. Below I provide a comprehensive look at how you can audit investments effectively and efficiently. ​The complexity of auditing investments varies. For entities with simple investment instruments, auditing is easy. Your main audit procedure might be to confirm balances. Complex investments, however, require additional work such as auditing values. As investment complexity increases, so will your need for stronger audit team members (those that understand unusual investments). Regardless, you need an audit methodology. First, let’s look at assertions. The audit client is asserting that the investment balances exist, that they are accurate and properly valued, and that only investment activity within the period is recorded. While investment balances in the financial statements are important, disclosures are also vital, especially when the entity owns complex instruments. Second, perform your risk assessment work in light of the relevant assertions. What types of investments are owned? Are there any unusual investments? If yes, how are they valued? Is a specialist used to determine investment values? Do the persons accounting for investment activity have sufficient knowledge to do so? Are timely investment reconciliations performed by competent personnel? Are all investment accounts reconciled (from the investment statements to the general ledger)? Who reconciles the investment accounts and when? Are the reconciliations reviewed by a second person? Are all investment accounts on the general ledger? How does the entity ensure that all investment activity is included in the general ledger (appropriate cutoff)? Who has the ability to transfer investment funds and what are the related controls? What investment accounts were opened in the period? What investment accounts were closed in the period? Who has the authority to open or close investment accounts? Are there any investment restrictions (externally or internally)? What persons are authorized to buy and sell investments? Does the entity have a written investment policy? Does the company use an investment advisor? If yes, how often does management interact with the advisor? How are investment fees determined? Are there any investment impairments? Who is responsible for investment disclosures and do they have sufficient knowledge to carry out this duty? Are there any cost or equity-method investments? As we ask questions, we also inspect documents (e.g., investment statements) and make observations (e.g., who reconciles the investment statements to the general ledger?). If control weaknesses exist, we create audit procedures to address them. For example, if during the walkthrough we note that there are improperly classified investments, then will plan audit procedures to address that risk. Third, consider the directional risk of investments. The directional risk for investments is that they are overstated. So, in performing your audit procedures, perform procedures to ensure that balances are properly stated. Fourth, think about the risks related to investments. Fifth, think about control deficiencies noted during your walkthroughs and other risk assessment work. Sixth, now its time to assess your risks. When control risk is assessed at high, inherent risk becomes the driver of the risk of material misstatement (control risk X inherent risk = risk of material misstatement). For example, if control risk is high and inherent risk is moderate, then my RMM is moderate. The assertions that concern me the most are existence, accuracy, valuation, and cutoff. The assertions that concern me the most are existence, accuracy, valuation, and cutoff. So my RMM for these assertions is usually moderate to high. My response to higher risk assessments is to perform certain substantive procedures: namely, confirming investments, testing investment reconciliations, testing values, and vetting investment disclosures. And finally, it’s time to determine your substantive procedures in light of your identified risks. I don’t normally test controls related to investments. If controls are tested and you determine they are effective, then some of the substantive procedures may not be necessary. Now you know how to audit investments. Next, we’ll see how to audit plant, property and equipment. 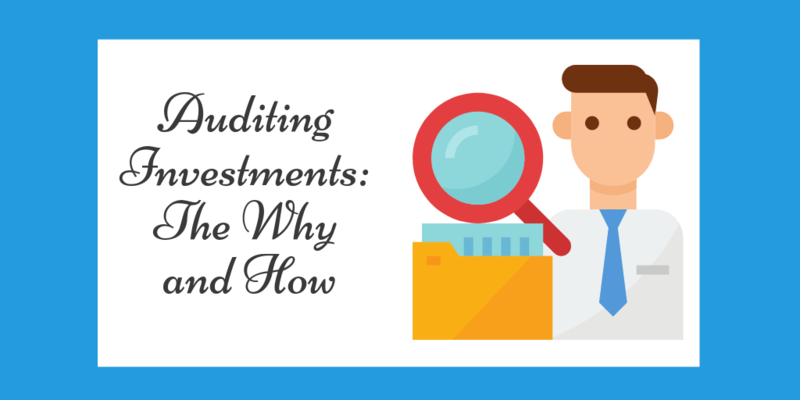 This post is a part of my series The Why and How of Auditing. Check my other posts. Are you missing out on opportunities to be even more efficient as a CPA? Here are ten super easy ways to increase your productivity. First, I see too many CPAs hen-pecking around, trying to find information in their electronic piles. Many times the quickest route to finding information is Control f (Command f on a Mac). Hold your control key down and type f. This action will usually generate a find dialog box–-then key in your search words. Control f works in Excel, Word, PowerPoint, and Adobe Acrobat. Computers can’t read all electronic documents (that is, not all documents are electronically searchable). Sometimes you need to convert the document using OCR. OCR stands for optical character recognition. So how can you make an electronic document readable and searchable? Scan documents into Adobe Acrobat and use the OCR feature to convert bitmap images into searchable documents. Then use Control f to locate words. When should you OCR a document? Typically when it’s several pages long. Do so when you don’t want to read the entire document to find a particular word or phrase. For example, suppose your client gives you a one-hundred-page bond document, and you need to locate the loan covenants. Rather than reading the entire document, convert it to searchable text (using Adobe Acrobat) and use Control f to locate each instance of the word covenant. A clean work surface enables you to think clearly. So make filing decisions quickly–as soon as a paper or electronic document is received. Keep your desk (and computer desktop) clean. You’re thinking, “But I’ll forget about the document if it’s not physically on my desk.” Allay this fear by adding a task in Outlook to remind you of the scanned document (you can even add the document to a task). I create tasks with reminders. So, for example, the reminder pops up at 10:00 a.m. on Tuesday; attached is the relevant document. That way I don’t forget. For more information about scanning, see my post How to Build an Accountant’s Scanning System. I also recommend David Allen’s book Getting Things Done which provides a complete system for making filing decisions. An open door says what? Come in. A cracked door says what? Knock and come in. A closed door says what? Don’t enter, especially without knocking. I close my door for about an hour at a time. Additionally, I turn off all electronic devices and notifications. Doing so allows me to focus on the task at hand. If you have an iPad, a cheaper alternative to Livescribe is Notability. Another idea is to take breaks and naps. Counterintuitive? Yes, but it works. I come from the old school of “don’t lift your head or someone will see how lazy you are.” I’m not sure where this thinking comes from, but you will be more efficient–not less–when you take periodic breaks. I recommend a break at least once every two hours. Research shows you will be more productive if you take a nap during the day. It doesn’t have to be long, maybe ten or fifteen minutes after lunch. You’ll feel fresher and think more clearly. According to Dr. Sandra Mednick, author of Take a Nap, Change Your Life, napping can restore the sensitivity of sight, hearing, and taste. Napping also improves creativity. Winston Churchill’s afternoon nap was non-negotiable. He believed it helped him get twice as much done each day. For empirical evidence that naps help, check out the book Rest, Why You Get More Done When You Work Less. Also, here are more ideas to create energy in your day. If you pause every time you get an email or a phone call, you will lose your concentration. Therefore, try not to move back and forth between activities. Do one thing at a time since multitasking is a lie. Pick certain times of the day (e.g., once every three hours) to answer your accumulated emails or calls. See my article Text, Email or Call: Which is Best? I run (by myself) or walk (with my wife) six days a week–usually in the morning before work. Exercising helps my attitude and clears my mind. Also, I feel stronger late in the day. 9. Lunch at 11:30 a.m. or 1:00 p.m.
Another idea: Go to lunch at 11:30 a.m. or 1:00 p.m. Why stand in line? Finally, I usually don’t work on Sundays (even in busy season). For me, it’s a day to worship, relax, see friends, and revive. I find the break gives me strength for the coming week. These are my thoughts. Please share yours. Do you know what you need to know about emphasis-of-matter and other-matter paragraphs? Sometimes auditors elect to or are required to add an extra paragraph after the opinion paragraph. You need to know why and when. This post gives you the leg up on emphasis-of-matter (EOM) paragraphs and other-matter (OM) paragraphs. First, let’s first define the two terms. Emphasis-of-matter paragraph. A paragraph included in the auditor's report that is required by GAAS, or is included at the auditor's discretion, and that refers to a matter appropriately presented or disclosed in the financial statements that, in the auditor's professional judgment, is of such importance that it is fundamental to users' understanding of the financial statements. Other-matter paragraph. A paragraph included in the auditor's report that is required by GAAS, or is included at the auditor's discretion, and that refers to a matter other than those presented or disclosed in the financial statements that, in the auditor's professional judgment, is relevant to users' understanding of the audit, the auditor's responsibilities, or the auditor's report. Now, let's take a look at sample EOM and OM paragraphs. As discussed in Note X to the financial statements, the Company has elected to change its policy for determining cash equivalents in 20X 7. Our opinion is not modified with respect to that matter. In our report dated April 18, 20X5, we expressed a qualified opinion since the Company’s main office had a material unrecognized impairment loss. As noted in Note 12, the Company has now recognized the impairment in conformity with accounting principles generally accepted in the United States of America. Accordingly, our present opinion on the restated 20X4 financial statements, as presented herein, is different from that expressed in our previous report. You also need to know the presentation requirements for EOM and OM paragraphs. See exhibit B of AU-C 706 for a complete listing of AU-C sections requiring EOM paragraphs. An EOM is commonly required when a company has a change in an accounting principle (that has a material impact). AU-C 708 Consistency of Financial Statements paragraphs .07-.08 provides guidance on when the EOM is required. The auditor also has an option to use an EOM to emphasize matters that are not required by audit standards. So, sometimes EOMs are included because they are required (e.g., going concern) and, other times, they are optional (e.g., to highlight a related party transaction). See exhibit C of AU-C 706 for a complete listing of AU-C sections requiring OM paragraphs. Of course, creating your opinion is just a part of wrapping up your audits. The audit risk model enables you to focus on the important--and to ignore the unimportant. It is the key to performing efficient audits. So, today, we look at how to understand the audit risk model. Remember the cowboy movie The Good, The Bad, The Ugly? Well, in audits we have the same. The Good. The audit firm issues an unmodified opinion and the financial statements are fairly stated. Moreover, the audit file properly supports the opinion. The Bad. The audit firm issues an unmodified opinion and the financial statements are fairly stated, but the work papers are weak. The audit firm just got lucky. The Ugly. The audit firm issues an unmodified opinion but the financial statements are not fairly stated. Material error (or fraud) is present. And the audit file…well, we won’t go there. It’s ugly. Audit failure occurs when an audit firm issues an unmodified opinion and the financial statements are not fairly stated. A material misstatement is present and the auditor doesn’t know it. In other words, audit risk is the result of what the company does (or does not do) and what the auditor does (or does not do). The first two (inherent risk and control risk) live in the company’s accounting system; the third (detection risk) lies with the audit firm. As the the risk of material misstatement (the company’s risk) increases, so should the auditors work. Proper audit work decreases detection risk (the risk that the auditor will not detect material misstatements). To understand the audit risk model, consider the tale of a villain. A villain (inherently a thief) desires to make his way into your home. You have locks on your doors and an alarm system (controls, if you will). But you forget to lock your back door and you don’t set the alarm. During the night, the thief comes in and steals your money. You see the thief fleeing away, but you don't know how much you've lost. So, what’s next? You call the police. Why? To see if everything is okay. This is the audit risk model in physical form. Think of a material misstatement as a villain. Its nature is to be wrong (inherent risk). If internal controls are weak or absent (control risk), the misstatement survives. And if the auditor fails (detection risk), the villain lives on without being caught. Inherent risk is what a transaction is (independent of related controls). There is a higher risk of misstatement—or not. And where does this risk come from? The transaction’s nature or its environment. Internal controls are necessary when a transaction is risky. Why? To monitor and manage the risk. Think about the words internal control. First, internal means the control occurs within the company. Second, control means to manage. Since some transactions are more prone to theft or error, companies need internal controls to prevent or detect misstatements. If internal controls are designed appropriately and work correctly, the financial statements should be materially correct. But if the internal controls are absent or ineffective, material misstatements can occur. What then? Well, it’s up to the auditor. The auditor is tasked with detecting material misstatements. If he or she does not, audit failure occurs. The audit firm issues an unmodified opinion but a material misstatement is present. Auditors decrease detection risk—the risk that material misstatements will not be detected—by appropriately planning and performing their work. Consider ​pricing your riskier audits at a higher amount. Congratulations! You've won a new audit client. Now, let's consider the first year audit considerations. In this post, I explain why it's necessary to obtain supporting information for opening balances and how contacting the predecessor auditor is to your advantage. AU-C 510.08 states "The auditor should obtain sufficient appropriate audit evidence about whether the opening balances contain misstatements that materially affect the current period's financial statements." If you are unable to obtain such information, then you will need to qualify or disclaim your opinion. So, it's important to get comfortable with these balances. Some auditors think, "Well, I'll just review the prior year audit report." That's a good start, but not good enough. Why can't we just review the prior audit report? If the prior audit covered the period ending December 31, 2018, it does not cover the January 1, 2019 balances. If your audit is for the year ended December 31, 2019, then reviewing the audited financial statements for the year ending December 31, 2018 helps but it does not ensure the legitimacy of the January 1, 2019 opening balances. The audit standards state that the auditor has to determine whether the prior period closing balances were correctly brought forward to the new period. Additionally, we need to consider how the predecessor's audit work affects our current year risk assessment (more in a moment). Also, determine that the opening balances are in compliance with appropriate accounting policies. If the prior year financial statements were created using the modified cash basis of accounting but GAAP financials are required in the current year, then bringing forward prior year balances won't do. GAAP is full accrual; the modified cash is not. Additionally, the audit standards state that the successor auditor should perform "specific audit procedures to obtain evidence regarding opening balances" (per AU-C 510.08). You might, for example, examine the depreciation schedule for the prior year and compare it to the opening balances. For debt or investments, you could confirm the opening balances (I'm not saying this is required, just an option). For some (less significant balances) you might examine investment statements or loan amortizations and agree those to the opening balances. The opening balances for current assets or liabilities might be proven by activity early in the current year: Were prior year receivables collected? Were prior year payables paid? Did the successor auditor obtain sufficient appropriate audit evidence regarding opening balances about whether opening balances contain misstatements that materially affect the current period's financial statements and appropriate accounting policies reflected in the opening balances have been consistently applied? The peer reviewer will look for documentation as it relates to opening balances. If not present, then there is a problem. At a minimum, write a memo stating how you got comfortable with all significant opening balances. And create an audit program related to opening balances. Reviewing the predecessor auditor's workpapers is one of the more unpleasant duties of an auditor. I did so recently. The predecessor auditor is a friend of mine. As I visited him, I was uncomfortable. He was cordial, respectful, and nice. Some predecessor auditors don't exactly roll out the red carpet for you (and I get that). I try to remember the importance of professional courtesy when I lose a job (though it stings my pride). If the auditor succeeded another auditor, did the successor auditor initiate communications with the predecessor auditor to ascertain whether there were matters that might assist the auditor in determining whether to accept the engagement? Why call the predecessor auditor? To see if there were disagreements between the auditor and the company. To see if there were ethical issues. Additionally, you need to request permission to review their prior year workpapers. AU-C 510.A 7 says, "The extent, if any to which a predecessor auditor permits access to the audit documentation...is a matter of the predecessor auditor's professional judgment." Translation: They don't have to permit access, but they (generally) should. If the predecessor allows access to their workpapers, you can use that information in planning your current year audit. See what your firm's quality control document says about initial audits. Many firms require an engagement quality control review (an EQCR) for first-year engagements. (If yours does not, consider adding it to your QC document.) Why? New audits take a great deal of time. Because they do, it's tempting to cut corners. An EQCR lessens the temptation. The engagement partner knows the engagement will be reviewed by another firm member (often, another partner). Contacting the predecessor auditor may be the best thing you can do prior to accepting an audit. They might tell you, for example, that the potential client is unethical or that they are slow to pay their audit fees. Because you desire a healthy book of business, this step may save you plenty of headaches. As I've said before client acceptance is the important audit step. If you accept the engagement, consider how the predecessor's responses and workpapers affect your risk assessment. Were there several material audit adjustments in the prior year? Did the predecessor auditor issue a material weakness letter? Then such considerations should be included in your current year risk assessment. The predecessor auditor's work can also help you get comfortable with opening balances.